Size: 6.0" x 3.0" x 1.4"
Corvus, the consumer division of the famous IC manufacturer MOSTEK, introduced with the Model 310 a basic four-function calculator with added square-root and percent keys. Learn more about Mostek Calculator Integrated Circuits. • Model 310: Includes four AA-sized batteries. • Model 311: Includes four AA-sized batteries and an AC adaptor for 115V. • Model 312: Includes rechargeable NiCd-batteries and an AC charger for 115V. The Corvus 320 series removed the square-root function but added a full memory. 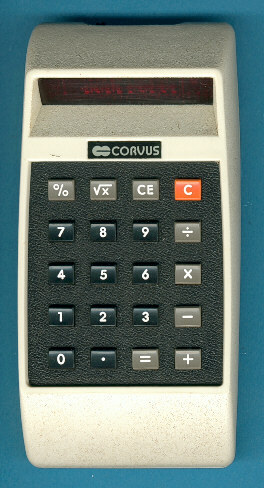 Other calculators sold under the Corvus brand are the 400, 415, 500, and 615 models. Don't miss the colorful Corvus 804. Don't miss the Magiclick 450, a perfect doublette of the Corvus calculator using a brain manufactured by Rockwell.